EDITED to clean up after the copying from MSWord Fiasco. I joined back in November and you were all very helpful while I struggled with getting my starter going - thank you! It did eventually take flight and since then I've watched an embarrassing number of tutorials and baked three or four times a week. Not as much bread to eat as you'd think, since many a sad, flat frisbee went straight into the trash. The last few weeks something clicked with my handling of the dough and the holy trinity I've been chasing - flavor, oven spring, lacy crumb - showed up on the regular. However, once you become a known sourdough baker, weird things happen. Like someone gives you a sourdough cookbook they brought home from an Alaskan cruise in the 1990s, with three packets of Alaskan sourdough starter stapled to it. I wondered if I could resurrect one of these twenty-year-old starters. The cookbook was written in 1976 and has stayed in print (according to Amazon) until 2015. It's been entertaining reading. I do not often see a paragraph that starts like this - "Let's say you are faced with a forty-mile mush." Nor has anyone ever offered me a sandwich made of sourdough bread and ‘a thick slab of headcheese made from a moose's nose.’ Boy, those Alaskans aren't afraid of anything. But I figured what did I have to lose? Yesterday at noon I mixed water and flour, with the amounts scaled to the 10 grams of starter in the packet, and set the jar on top of the fridge. Nothing much happened last night or this morning. It had the texture of putty and smelled like raw flour. I went about my dough mixing and stretch and folds. I was firing up the oven for the first of two bakes, when I saw there was bubbly activity and rising. I really thought it was probably dust, but holy moly. It’s alive! I am so excited about this. Two more days of feeding, and am I am going to bake with this bad boy. Now I am trying to reign in my glee, because maybe it’s just the bacteria already present in flour and water, the same as would happen if I was trying to make my own starter from scratch. Does anyone have experience with coming across an old packet of starter and reviving it? WIll it make edible bread or does a long period of dormancy adversely affect flavor? I'm impressed that it worked, and that you got it to do so. By the way, did you type your ideas in Word and then paste them here? There's a lot of trash in your post, and that might be the source. You could probably use Notepad or whatever simpler thing, instead of Word, to avoid the random-trash problem and still achieve your preference of typing in a separate window. baffled me. I tried the edit tab multiple times, but just kept rowing in a circle. After reading your comment I pasted the text into an email and copied that. Live and learn. sitting on a shelf. I don't even remember where or when I got it. I never bothered to open it because I have an awesome starter I've been using for 20-some years. That one was resurrected from dry stuff obtained from the Friends of Carl. I believe the packaged starter will come to life when I take the time. But the question you asked came to my mind as well: will it be a true Alaskan starter or just another version of what I now have, 20+ years later. Then there is the never ending discussion of whether a starter originating somewhere else can be maintained as it was when it lived there, like the true San Francisco starter. I brought some of that home from SFBI but since I made bread with it every week side by side with my Carl starter, eventually they were negligibly different from each other. Cross-contamination? Maybe. Hence, the discussion rages on. At the end of the day what matters is when the bread kicks in the oven, has great taste and texture, photos well enough to make other people's mouths water, and generates new friends who are always looking for good bread and love to discover someone who can provide it. 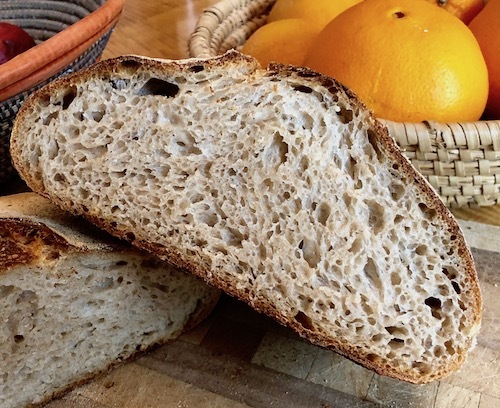 At the end of the day what matters is when the bread kicks in the oven, has great taste and texture, photos well enough to make other people's mouths water, and generates new friends who are always looking for good bread and love to discover someone who can provide it. I've been sent dried starter from a friend in Brooklyn, raised one myself using the Wink protocol, and rehydrated one of the free packets from friends of Carl. They all performed well, and after three months are indistinguishable from each other. There's real skill in that loaf. Nicely done!